From here, you can take two magnificent tours: the one of the ”Pueblos Blancos” (White Villages), leading you to the wonders of the Grazalema Natural Park and the wine route, taking you down to Jerez. 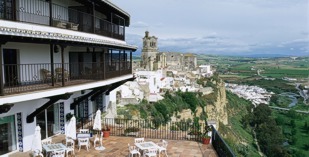 The Arcos de la Frontera Parador has 15 twin, 5 double and 4 single bedrooms all having satellite TV, mini bar and safe. The bedrooms with terraces offer magnificent views of Arcos and inside the typical Andalusian courtyard there are traditional decorative elements such as latticework and ceramic tiles. The Parador of Arcos de la Frontera has air conditioning, bar, restaurant, facilities for the disabled, heating, piped music, cable TV, telephone, wireless internet, currency converter, elevator and gift shop. 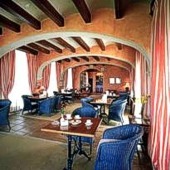 The parador group serves the regional dishes in all their restaurants and each has a gluten free menu. In Arcos de la Frontera, you should visit the Santa Maria and San Pedro churches, the Castle and the Palaces, the Art Gallery, and the carpet factory. Also follow the route of the ”Pueblos Blancos”, going from Arcos to Bornos, and the Route of the Wine. The Easter celebrations at Arcos, have been declared of International Tourist Interest. Discover the traditional ”Aleluya bull burial”, which takes place on Resurrection Day. Visit also the Horses Fair in Jerez de la Frontera, 20 miles away from the Parador. Get to know the Sierras (Mountains) de Grazalema natural Park, and the lake of Arcos. These areas are good for hiking, riding horses, and hang gliding. You may also play golf on one of the courses near the parador. Distance from the nearest airport is approximately 35 kms, train station is 35 kms away and the nearest port is 70 kms away. The staff was wonderful, especially the dining room staff. We were a little unclear about media pension stay and which meals were included, but we enjoyed each meal. The view is fabulous and we were very grateful to have a room with a balcony. This is Our second stay at Parador Arcos de la Frontera in conjunction with the MotoGP in Jerez. The location and the warm welcome is special. This very Nice old style hotel with a breathtaking view is something that has to be experienced. We will be back. Wij bezochten in juni 2014 deze Parador, vriendelijk en authentieker Spaanse parador. Hou wel rekening met zeer kleine straatjes, soms denk je de auto kan er niet door. Ook parkeren is moeilijk op het plein voor het hotel.in de omgeving veel leuke kroegjes. Eten in hotel was beperkt maar van een goede kwaliteit. Zeker een aanrader om naartoe gegaan. 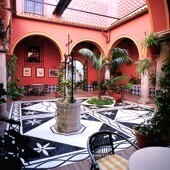 We stayed in Los Arcos' Parador for one night, the 3rd March this year. Access by motor vehicle to the parador is extremely complicated, and there are no signs at the access points to the town or anywhere else. After some attempts, we asked somebody to show us, exactly on the map, an access route through the one way system, and arrived. Even in winter, the parking on the square was a catastrophe, but one of the hotel reception staff kindly vacated her spot as she was leaving shortly. We particularly enjoy the wonderful regional dishes in the paradors we visit, but here the dining room was closed, there were some staff sitting in the dark there, and we were relegated to the cafeteria, with a very limited menu. This was a great disappointment. All the other paradors we visited were exemplary, and we would not hesitate to recommend them, but won't go back to the one in Los Arcos, despite the friendly receptionist. 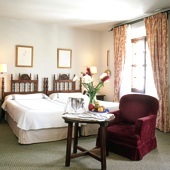 A former palace with panoramic views in Arcos de la Frontera is now a three star Parador hotel.